Barotse Royal Establishment (BRE) Induna Katema (Aketata Batunda) has been obtaining money from unsuspecting foreign journalists who come to cover the Kuomboka ceremony in Barotseland (Western Province). Investigations by the Zambia Watchdog have revealed that before this year’s Kuomboka ceremony which had earlier been scheduled for April 21st and later moved to April 28th 2018, Induna Katema repeatedly accosted a foreign Journalist from the German based Geo magazine and asked him what he was doing in Barotseland to which he responded that he was in Mongu to cover the 2018 Kuomboka ceremony and that his stay was extended as a result of the postponement of the ceremony. Induna Katema threatened the Journalist, a Mr Richard who was lodging at Liseli Lodge that he was going to be deported from the region before the ceremony. Few days before the ceremony Induna Katema went back to Liseli Lodge in the company of his security men and extorted $700 US dollars from Mr Richard after threatening to eject him from Barotseland. On the day of the Kuomboka ceremony Mr Richard inquired from several foreign Journalists on how much they paid for them to cover the ceremony and was shocked to be told that they did not pay anything as there was no such requirement. 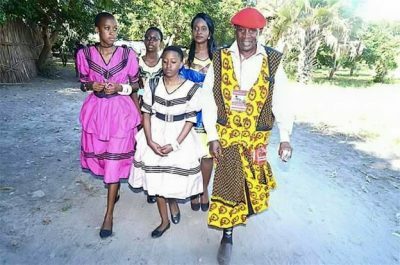 After he narrated his ordeal with Induna Katema, a CNN crew told Richard that last year the same Induna Katema forced them to pay him $2,100 US dollars before they were allowed to cover the ceremony. Mr Richard had come to do a documentary on the Kuomboka ceremony and culture in Zambia but after his experience with Induna Katema he said he was going to do a story on corruption in Zambia. He lodged a formal complaint with the Ministry of Tourism who promised to file a complaint to the BRE through the Western Province Permanent Secretary but it is doubtful that anything was done on the matter as the Zambian government itself has been handing bribes to corrupt elements in the BRE and the Litunga himself for them to frustrate the people of Barotseland on pending issues regarding the Barotseland Agreement of 1964.